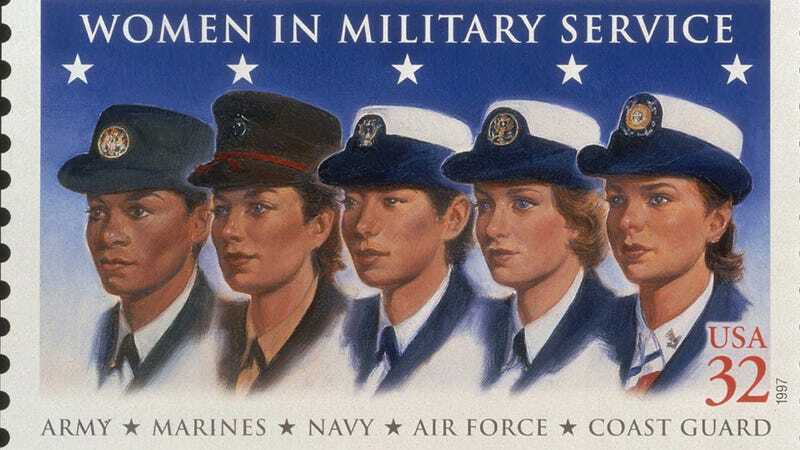 We're not sure if the title of the Associated Press's report on whether women will be drafted now that they'll be fighting on the front lines — "Listen Up Ladies! Uncle Sam Might Want You Too" — is patronizing or sarcastic or what. (It'd make sense on a blog but seems a bit weird coming from the AP.) It skews towards patronizing, with phrases like "Tennnnnn-hut, ladies! The next time Uncle Sam comes calling, he's probably going to want you, too" and "but if you're worried a draft notice is going to soon be in your mailbox, take a deep breath. There is no looming national crisis that makes a military draft likely." Uh, thanks? Lawmakers (and most of the nation) recoiled in horror when Jimmy Carter once tried to get young women to sign up for the draft, and surely many conservatives would still consider drafting women "unfeminine" today. But as Hegar pointed out, women are either equal or they're not. Let's go with "they are."